Ajit Singh, Charlotte Bannister-Parker, Tim Stevenson, Charanjit Ajit Singh, Monawar Hussain, Chinta Kallie. On Tuesday 11th May 2010 the latest, updated and enlarged, version of the Directory of Faith Communities in Oxford was launched at the University Church, hosted by Rev Charlotte Bannister-Parker on behalf of the International Interfaith Centre (IIC), the publisher of the printed and online Directory. 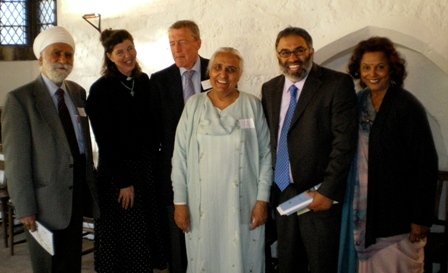 Guests were welcomed by Madeleine Harman, IIC trustee, who introduced Charanjit Ajit Singh, Chair of IIC Trustees and Tim Stevenson, Lord Lieutenant of Oxfordshire, who shared short meditations on the theme of interfaith cooperation and community building. Thanks were expressed to the Directory team and the young volunteers who assisted the project, particularly Nathan Shipstone, and to all the faith communities who fill the Directory pages. Refreshments were served and Directories were available to buy at £5 each. Copies can still be bought by sending a cheque for £6.50, to include p&p, made payable to the International Interfaith Centre and sent with your order to the IIC’s address. This can be found on the Contact Us page of the website and also on the right hand side of this page. It will be possible for a limited time to collect copies for £5 each – email: iic AT interfaith-centre.org for details. If your community is not in the printed Directory do send us your details following the existing format and we can include you in the online version. If you are included and your details change please contact us at the email address above. 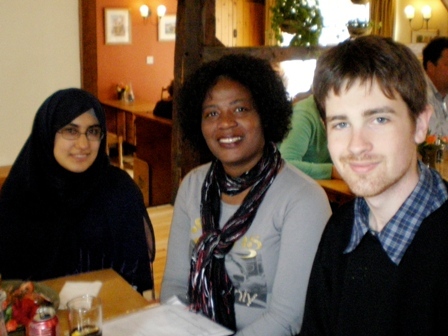 The 3 volunteers who helped prepare the revised and updated version of the Directory of Oxford Faith Communities.